The Nikon Capture NX-D is a free software application that lets you edit RAW images with simple and complete operations. It ensures high-quality processing and adjustments of RAW images taken with a Nikon digital SLR camera, an advanced Nikon 1 interchangeable lens camera, a Nikon COOLPIX¹ compact camera, or any other camera that supports RAW images. Designed specifically for RAW image adjustment , it incorporates a native processing system to get the most out of Nikon camera performance. 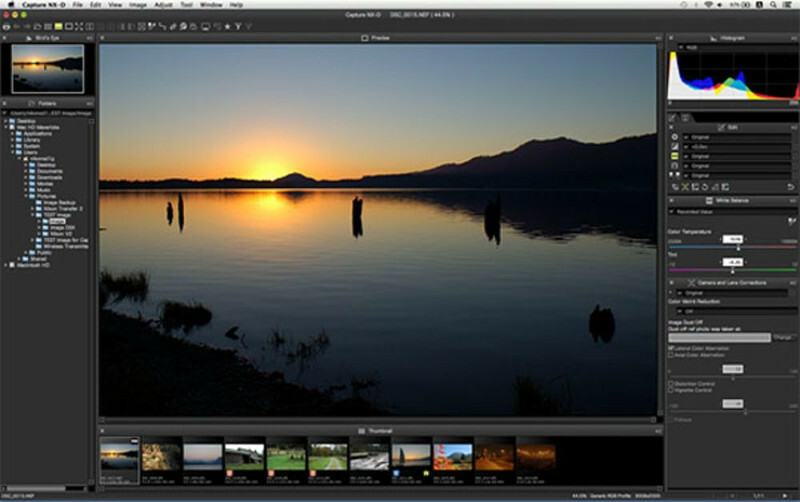 Also supports simple editing of JPEG and TIFF images. Simple floating pallets for use with a large monitor or multiple monitors. Multiple display possibilities , including comparative display of several images or images before and after treatment. Introduction of a related format, which saves the setting data in a separate file. Absolutely intuitively, I reached the Exposition's slider and repaired what I had to do, of course, during the shooting. However, no great miracle happened, the image remained very contrasting. So I tried to lower the Contrast parameter. But ah... instead of reducing the contrast, the program cut the shadows - moved the left edge of the histogram to the center. When I failed with the Contrast parameter, I tried to work with the Black Point value, then the curve, but the result was still unsatisfactory. I do not want to blame for Zoner Photo Studio, maybe I just can not do it, but after a while I have patience and I opened the photo in Capture NX-D. So still adjust the contrast. In Picture Control, I just selected Auto for Contrast. Heuréka! It works perfectly. The auto mode lowered the contrast by one degree, I then manually "o fous" took the exposure correction and the shot was done. Pictures are shadows or lights, tonality is almost ideal. What is the resume? I'm not saying that the Capture NX-D is the ideal program - many features are missing, the interface is not the most appropriate, it is not the fastest, but... Because I often experiment with the other "RAW" makers, I have a lot of comparative tests. However, it has always been confirmed that Capture NX-D will handle the best of all software (with Nippon NEFy or NRW files, of course) for the older Capture NX2. Yes, I've still tried the same photo at Apple's Aperture. It was, the "eperker" had a good idea with her, but it did give me a lot more work. For example, I had to move the curve, which is a function of computer graphics rather than a photographer. In Capture NX-D, I went "as a photographer" - corrected the exposure, corrected the contrast and three minutes later. That's the way it's supposed to be. Here is the download link!